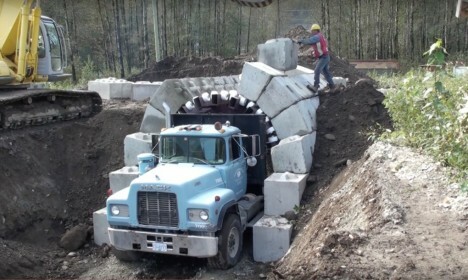 A bit like zipping up a coat, this “zipper truck” assembles tunnels and arches by fitting together concrete blocks from both sides, eliminating the need for mortar while also cutting down construction time by up to 90 percent. The truck component is backed by a system of rollers around a metal core. 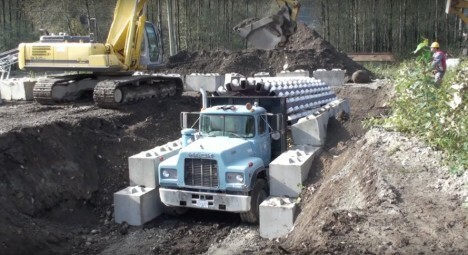 The locking blocks slide into place as the truck rolls slowly forward, like closing an interlocking zipper. No special joinery is needed, plenty of strength and seismic resistance are achieved and, maybe best of all, the blocks can always be uncoupled later and reused elsewhere. Used for everything from tunnels and shelters to archways and overpasses, the system is exceedingly fast: 24 hours for a quarter mile of tunnel. Most of the heavy lifting is done by the machine, with workers simply feeding blocks into the system and moving the truck forward. See more in Mods & Custom or under Transportation. April, 2016.